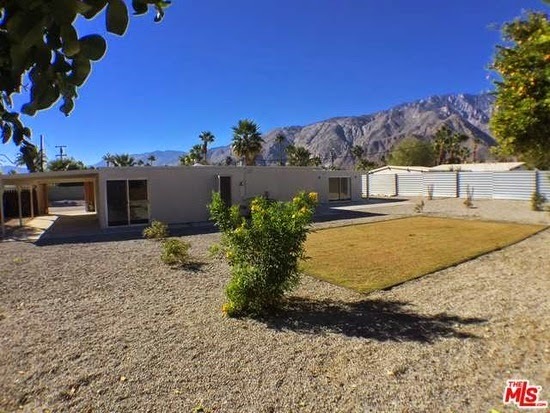 Here’s a recently flipped 1,900 square-foot 1959 three bedroom, two bathroom Palmer & Krisel-designed home for sale in sunny Racquet Club Road Estates in Palm Springs, California. This home has been expanded from its original floor plate of 1,225 square feet to 1,900 square feet, with permits, still retaining the original 3-bedroom setup, and priced at a fairly reasonable $499,000. 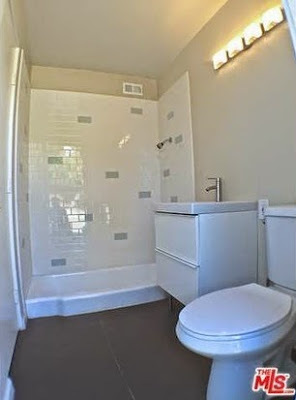 Pretty much everything in this home is new and waiting for that personal touch. The signature Krisel-beamed ceiling are luckily still in place, as is the sunken bathtub. Other than that, there’s not much else original left in this home. All the finishes are mid-grade, from the light fixtures to the kitchen cabinetry. The ever-popular Ikea Godmorgon bathroom vanities with Odenvisk sinks are present in both bathrooms. The baths additionally feature popular and simple white subway tile shower surrounds, with some splashes of neutral ‘color’. The kitchen is also Ikea, featuring chocolate brown Sektion cabinetry with simple pulls. 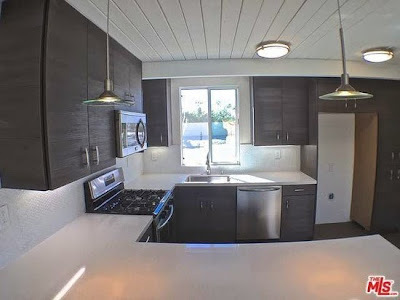 Kitchen backsplashes are clean and simple white penny-round tiles. Lighting was kept very simple and what appears to be budget-conscious, offering very little in the way of visual interest. 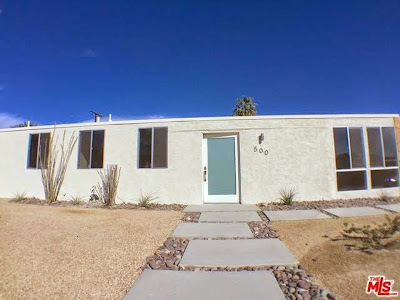 The front exterior of the home is simple Palm Springs modern, with pea gravel and turf in the backyard accented with random shrub placement, while the front yard features gold crushed granite and river rock surrounding the floating concrete pad walkway. Not visible (purposefully) in the listing photos are the strange flagstone accents surrounding the one-car garage – a simple fix that I’m surprised these flippers didn’t take advantage of during the renovation. The original carport and entry courtyard has been engulfed by the addition, which we can’t decide if it helps or hinders this property. One thing that Palm Spring is known for is a bold use of fun color pops. This house doesn’t contain that fun feature, which gives it a stark, sanity appearance. It needs a little fun side to make it more successful. Hopefully some new owners will move in and liven things up a bit.